Although colon cancer diagnoses are on the rise in the 20-49 age group – an age group which unfortunately doesn’t tend to look out for symptoms or get screenings – colon cancer is still more common in older people. 90 percent of people diagnosed with colon cancer are over 50. African American ethnicity. African Americans should begin screening colonoscopies at 45 years of age. A personal or family history of colon cancer or polyps. If detected and treated early, the survival rate for colon cancer is 90 percent, so reliable screening is vital. At-home colon cancer screening kits seem convenient, but they are less specific and sensitive than a colonoscopy, and prone to self-contamination. 13 percent of users will get a false positive, while others may get a false negative. Eight percent of colon cancers are missed and 58 percent of potentially precancerous adenomas go undetected. Would you ever feel truly confident in the results? The kits may also cost more than you expect. A positive result will mean you need a colonoscopy anyway, and as a second screening, the colonoscopy may not be covered by your health insurance. Colonoscopies are performed by highly experienced and qualified gastroenterologists. A screening colonoscopy is generally covered by insurance. However, if you are uninsured or must pay out of pocket, there are affordable options available (and you don’t have to sacrifice quality to take advantage of those options either). During your colonoscopy, your gastroenterologist will have the chance to not only screen for cancer, but also other colorectal conditions and abnormalities. Most importantly, they will take the opportunity to remove cancerous and precancerous growths – a vital preventive measure that at-home kits can’t provide. You don’t have to pay high prices for a high-quality colonoscopy. 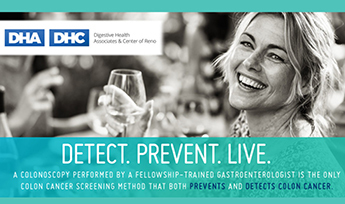 Choose a fellowship-trained gastroenterologist with a high adenoma detection rate (ADR) and book your appointment at an independent ambulatory surgery center with industry-leading AAAHC and CMS safety and quality certifications, like Digestive Health Center in Reno. Independent ASCs, like Digestive Health Reno typically charge much less than a hospital or hospital-affiliated center and offer the highest quality care. The state-of-the-art, AAAHC-accredited and CMS-certified Digestive Health Center in Reno is staffed by fellowship-trained and board-certified gastroenterologists, and highly experienced medical support staff. Costs are low and the center accepts most insurance plans, plus cash pricing and payment options are also available. Accessible parking and convenient curbside patient drop-off and pick-up are available as well. Click to request an appointment or learn more about our Digestive Health Center in Reno.